The waters around Cabo San Lucas provide some of the finest fishing in the world with a variety of species and year-round abundance of marlin. 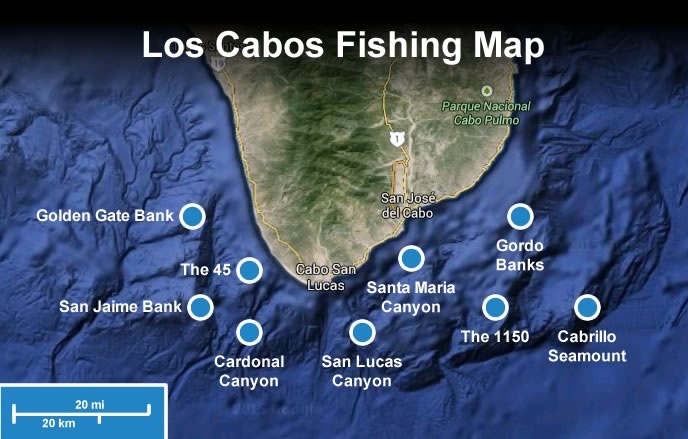 In fact, Cabo has earned the title of "Marlin Capital of the World" for its outstanding populations of striped, black and blue marlin. A sport fishing trip to Cabo is adventure travel indeed! Charter boats provide an excellent way to tackle the true Los Cabos fishing experience. Black Marlin – (Makaira indica) is the largest member of the marlin family, reaching a maximum weight of 1,000 lbs and lengths up to 15 feet. Trophy catches are generally females as males rarely exceed 300 lbs. The blue marlin is deep blue-black on top and silvery white below, with a spear-shaped upper jaw and prominent dorsal fin. The pectoral fins do not fold flat against the body, a key identification trait. These monster billfish represent a unique challenge for experienced sport fishermen. Blue Marlin - (Makaira mazara) is a highly prized game fish with a long, slender spear and is the second largest member of the marlin family. The color is cobalt blue above to silvery white below; this species may have light blue vertical stripes. 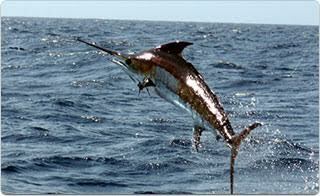 Blue Marlin can reach over 15 feet in length and weigh over 1,000 lbs, but the average weight is between 125 and 300 lbs. Blue Marlin feed on dorado, mackerel, mullet and small tuna. Striped Marlin - (Tetrapturus audax) are found in tropical to temperate Indo-Pacific seas, not far from the surface. This large game fish features an elongate, compressed body, light blue vertical stripes, long pectoral fins and a rounded spear. The Striped Marlin feeds on anchovies, mackerel, squid and crabs. This fish can reach over 13 feet in length and weigh more than 450 lbs. Los Cabos is known as the Striped Marlin Capital of the World, where this species can be found throughout the year in varying densities. Sailfish – (Istiophorus platypterus) are dark blue on top, blue-brown laterally and silvery white below. This large billfish is related to the marlin but is distinguished by the enormous sail-like dorsal fin running the length of its body. It can reach a length of 11 feet and weigh up to 200 lbs. This highly prized game fish is known for its incredible jumps when hooked. Extremely fast, individuals have been clocked at speeds up to 68 mph, the fastest reliably reported speed for a fish. Swordfish – (Xiphias gladius) is a large pelagic member of the billfish family and is exceedingly difficult to catch by anglers. With a broader tolerance for temperature variations than other billfish, the swordfish spends evenings near the surface but dives to depths between 1,000 and 2,000 feet during the day. 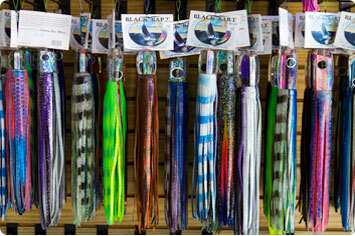 It feeds on mullet, squid, mackerel and small tuna. The long, flat sword, dark coloring and short dorsal fin distinguish this species. Swordfish may reach up to 15 feet in length and weigh up to 1,300 lbs. Dorado - (Coryphaena hippurus) also known as mahi-mahi and dolphin-fish, is prized as a delicious game fish. Found in off-shore temperate, tropical and subtropical waters, dorado are distinguished by their brilliant colors ranging from bright blue-green on the sides and back, to dazzling golden hues on their sides. Once removed from the water, the fish gradually fades to yellow-gray. Males feature a prominent, square forehead while females have a more rounded head and are generally smaller. Dorado can reach a maximum length of 6 feet and weigh more than 65 lbs., although most catches are less than 30 lbs. Wahoo - (Acanthocybium solandri), also known in Hawaii as ono, is a dark-blue, elongated fish with an iridescent green-blue back and a pattern of blue vertical bars. A member of the Scombridae (tuna, mackerel and bonito) family, this pelagic species is found from the Pacific side of the Baja peninsula to the east side of Baja. A fierce fighter, this species is extremely difficult to catch. Prized for a thrilling fight and good eating. Yellowtail – (Seriola dorsalis lalandi) are distinguished by a sleek, aerodynamic body, blue upper back, silver-white sides and belly, and yellow fins. While yellowtail can reportedly reach a length of up to 8 feet and weigh up to 110 lbs., Mexican fish are rarely 50 lbs in weight. Feisty fighter. Cabrilla - There are a number of different varieties of cabrilla (also known as sea bass or grouper) found in the waters of Los Cabos. These include the Barred Sand Bass, Kelp Bass, Damsel Bass, Starry Grouper, Golden Grouper and other species. These fish are generally found in areas with rocky bottoms or reef structures. The larger varieties are considered excellent for eating. Pargo - Several varieties of Pargo (also known as snapper) are found around Los Cabos. Varieties include the Mexican Barred Snapper, Blue-Gold Snapper, Colorado Snapper, Dog Snapper, Golden Snapper and Yellow Snapper. Most of the snappers reside in the first 200 feet of water, in shallow reef areas. Prized for its good eating.